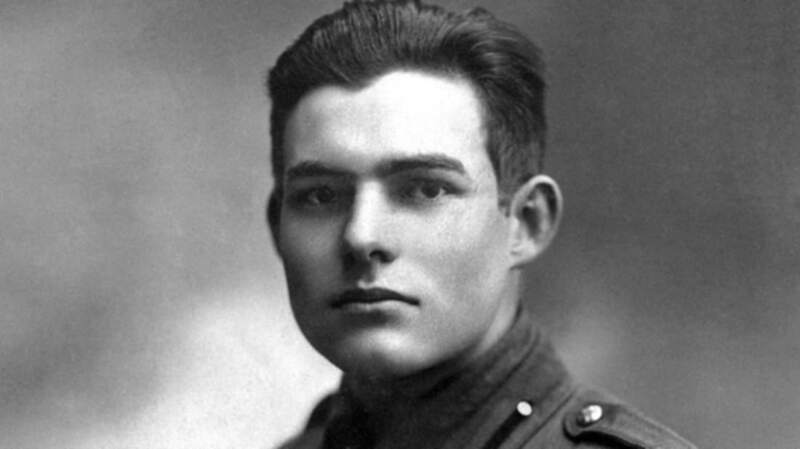 Before Ernest Hemingway was a literary giant, he was a cub reporter. When Hem graduated high school at 18, he moved to Kansas City and started a six-month stint with the Kansas City Star—a job that molded his trademark punchy, staccato style. Some of his early reporting feels rushed and raw. The pieces read like the typical journalese you see today (except that it rattled off lots more statistics about army recruiting events). But the longer Hemingway stayed at the Star, the more his style matured—and the more literary it became. Here are snippets from three of his articles. “George”' merely lifted a hand as though groping for something. Attendants hurriedly caught hold of him to keep him from rolling from the table. But he scratched his face in a tired, resigned way that seemed almost ridiculous, and placed his hand again at his side. Four hours later he died. “Why, doc? You don't mean it do you? Why, that'd be worsen sawing the periscope off of a submarine! I've just gotta have that thumb. I'm an old-time swift. I could set my six galleys a day in my time -- that was before the linotypes came in. Even now, they need my business, for some of the finest work is done by hand. With face drawn, and head bowed, he limped out the doorway. The French artist who vowed to commit suicide if he lost his right hand in battle, might have understood the struggle the old man had alone in the darkness. Later that night the printer returned. He was very drunk. "Just take the damn works, doc, take the whole damn works,'' he wept. As the war across the pond roiled, Hemingway was asked to cover the national tank training camp in Gettysburg, Pa. Instead, he came back with a piece about what it’s like to be inside a tank during an attack. The machine gunners, artillerymen and engineers get into their cramped quarters, the commander crawls into his seat, the engines clatter and pound and the great steel monster clanks lumberingly forward. The commander is the brains and the eyes of the tank. He sits crouched close under the fore turret and has a view of the jumbled terrain of the battle field through a narrow slit. The engineer is the heart of the machine, for he changes the tank from a mere protection into a living, moving fighter. Then a whistle blows, the rear door of the tank is opened and the men, covered with grease, their faces black with the smoke of the guns, crowd out of the narrow opening to cheer as the brown waves of the infantry sweep past. Then it's back to barracks and rest. This was Hemingway’s final—and favorite—Star article. By this point, he had abandoned the typical “who, what, where, when” journalistic lede and started the article with a scene and character instead. Three men from Funston were wandering arm in arm along the wall looking at the exhibition of paintings by Kansas City artists. The piano player stopped. The dancers clapped and cheered and he swung into "The Long, Long Trail Awinding.'' An infantry corporal, dancing with a swift moving girl in a red dress, bent his head close to hers and confided something about a girl in Chautauqua, Kas. In the corridor a group of girls surrounded a tow-headed young artilleryman and applauded his imitation of his pal Bill challenging the colonel, who had forgotten the password. The music stopped again and the solemn pianist rose from his stool and walked out into the hall for a drink.